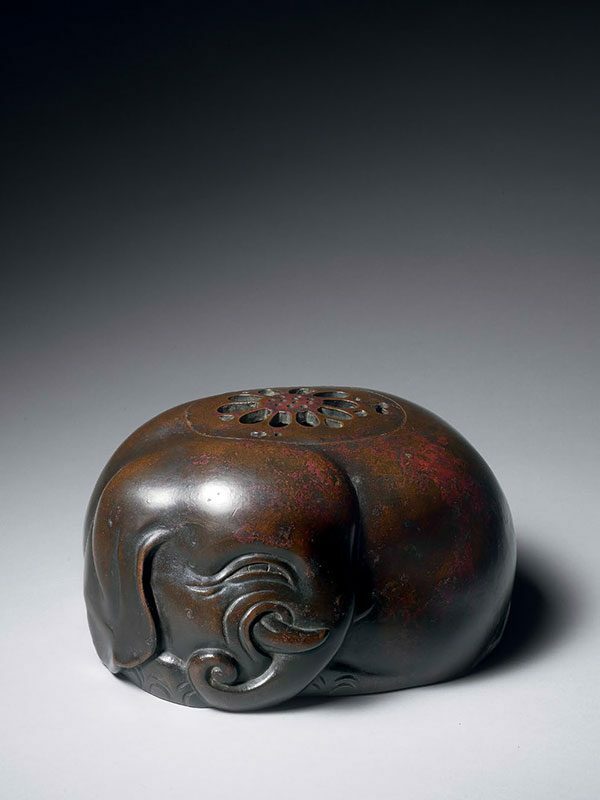 A bronze incense burner in the form of a recumbent elephant, the animal with its head turned, trunk curled up and tusks showing. The visible eye is open. The snugly fitting, removable lid is pierced with a chrysanthemum pattern. The base is flat. The incense burner has a dark chocolate patina, suffused with areas of bright red. The Japanese had not seen elephants until the 16th century, so depictions of elephants are invariably elaborated by the artist’s fancy. It has watery associations, because the Japanese believe the elephant to be derived from the Indian makatsugyo, a water monster. For this reason, the elephant is often seen as protector of wooden structures against fire.